보천사의 본존불로 얼굴과 신체에 약간의 손상이 있을 뿐 광배(光背)와 대좌(臺座)를 모두 갖추고 있는 작품이다. 머리에는 작은 소라 모양의 머리칼을 붙여 놓았으며 정수리 부분에 있는 상투 모양의 머리(육계)는 구분이 잘 안된다. 양 어깨에 걸쳐 입은 옷은 탄력없이 쳐지고 있으나 배에 있는 띠 모양의 매듭은 독특한 모습이다. 오른손은 무릎 위에 올려 손끝이 아래로 향하게 하고 왼손은 배 부분에 놓은 모양으로 땅속의 악귀를 물리친다는 의미를 지니고 있다. 이 불상에서 가장 중요한 부분은 부처의 몸에서 나오는 빛을 형상화한 광배(光背)의 표현과 부처가 앉아있는 대좌(臺座)이다. 머리광배와 몸광배는 모두 2중의 원으로 표현되었는데 원 안에는 덩굴무늬가 있고, 머리광배의 중심부분에는 연꽃무늬가 새겨져 있다. 광배의 곳곳에는 작은 부처가 새겨져 있으며 아래쪽에는 향로가 새겨져 있다. 가장자리에는 화려한 불꽃무늬가 광배 전체를 둘러싸고 있다. 대좌는 상·중·하 3부분으로 나누어지는데 윗부분에는 반원형태로 활짝 핀 연꽃잎이 새겨져 있다. 중간과 아래부분은 8각형으로 각 면에 연꽃무늬, 구름무늬, 비천상 등이 새겨져 있다. 섬세하고 화려한 광배와 대좌, 단정한 체구와 얼굴 등에서 9세기 불상의 전형적인 양식을 보여주는 작품이다. 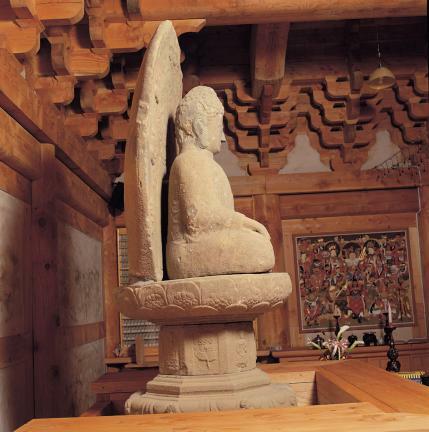 This is the principal Buddha statue at Bocheonsa Temple. 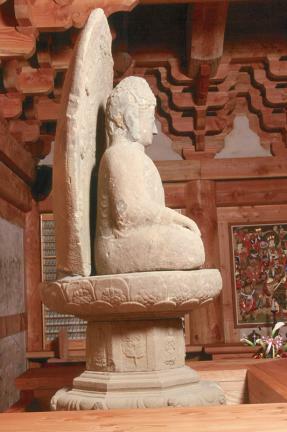 Although the face and body are a little damaged, the mandorla (Buddhist halo of light) and the pedestal of the statue are preserved well. The Buddha’s hair is expressed in the curly nabal style (i.e. twirled up and around in a seashell-shaped fashion), and an usnisa (a protuberance symbolizing supreme wisdom) can just be seen on top of his head. The clothing hanging from both shoulders seems stiff and sagging, but the knotted band on the stomach is unique. While the left hand is placed on the stomach area, the right hand rests on top of the knee with the fingers spread downwards in a gesture representing the expulsion of evil (Bhumisparsa mudra). 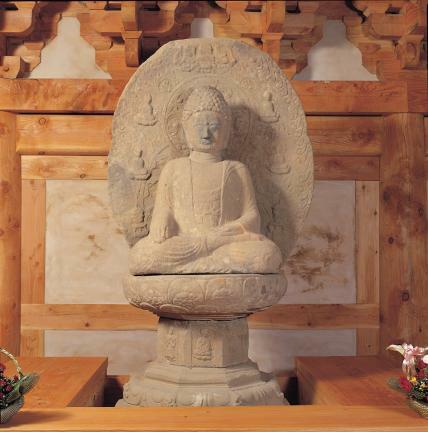 The most important part of this statue is the mandorla, which depicts the light emanating from the body, and the pedestal on which the Buddha is sitting. The dugwang (light radiating from the head) and singwang (light emanating from the body) are both depicted in double circles decorated inside with designs of vines, and the middle of the dugwang is engraved with lotus flower patterns. 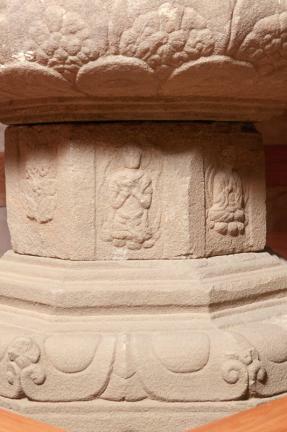 The mandorla is engraved in places with several small figures of Buddha, and its lower area is carved with a design of an incense burner. In addition, magnificent spark patterns are carved along the edges of the whole mandorla. 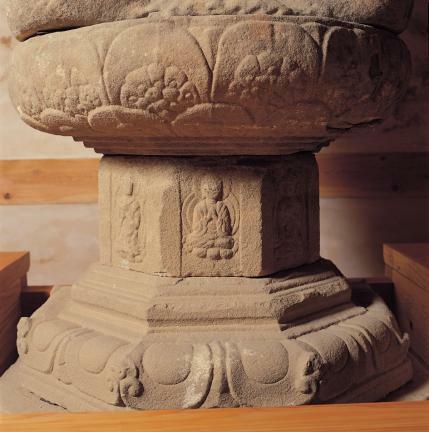 The pedestal is divided into three parts, upper, middle, and lower. The upper part takes the shape of a semicircle and is engraved with full-blown lotus flowers. The middle and lower parts are octagonal and are carved with patterns of lotus flowers, clouds, and flying maids. 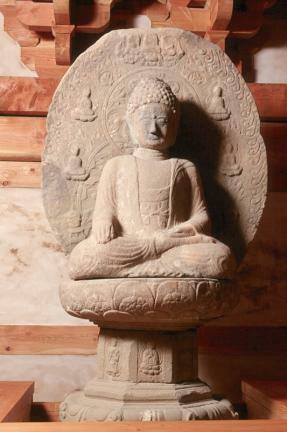 Judging from the sophisticated and splendid styles of the mandorla and pedestal, and the neat expression of the face and body, this is considered typical of the style of Buddha statues made during the ninth century.